Review: The four greatest world illusionists are known as “The Four Horsemen”. They pull off a series of heists against corrupt business leaders during their performances. They reward their audiences with the money. Great to get such a brilliant cast for this film. This did remind me very much of the film The Prestige (Michael Caine stars in both). There is a lot of C.G.I. in this and found it lost its way a bit with so much. Jake Gyllenhaal was considered for this film but declined. You got the feeling in this that all the actors enjoyed working together. 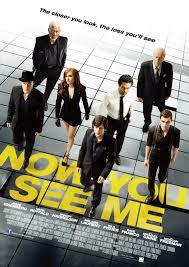 Now You See Me 2 is scheduled for 2016.